This trio in G major, with 'Gypsy Rondo', by Joseph Haydn is possibly one of the most popular pieces in the repertoire for Piano Trio. Here everything you could possibly wish for - with our large selection of sheet music titles for mixed ensembles, we can offer you large and small chamber music works, e.g. 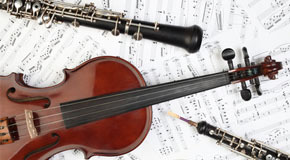 duets for stringed and wind instruments, piano trios, quartets and quintets or small vocal works and much more from classical, church music, jazz, folk, pop and rock.